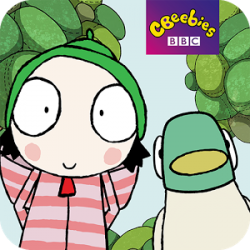 The Official BBC Sarah & Duck App! Safe, trusted, ad-free fun for your pre-school and nursery little ones. Join Sarah & Duck for a fun-packed day at the park where you can play hide and seek with Duck, create, decorate and fly your own unique kite, feed the hungry ducks, help Umbrella avoid the puddles and then build your very own park. Sarah & Duck are going to play a game of hide and seek. Can you use your detective skills to track down Duck in his secret hiding place? Count to ten and then tap the screen to find Duck. Create a beautiful kite for Sarah & Duck to fly. Enjoy building and decorating your kite in 5 simple steps – choose your shape, frame, decoration and tail. Then reveal your very own kite to Sarah & Duck. They’ll love it. It’s the perfect windy day for kite flying. Show off your excellent kite control skills in this speedy and fun catching game. Catch as many raindrops as you can and why not give rainbow a tickle for super bonus points and a giggle. The ducks are hungry and would like some of Sarah & Duck’s yummy bread. Pick the right shape of bread and watch the ducks gobble it down. Feed as many ducks as you can before the time runs out. It’s raining! Help get Umbrella home through this maze-based game as quickly as you can. But remember, Umbrella doesn’t like getting wet so be sure to avoid all those puddles. Time to try making a park of your very own. Let your creative skills run wild by picking from a whole host of decorative objects and your favourite characters. Watch in delight as your completed park comes to life with animations, and don’t forget to take a photo snap as a memento. This app will ask for permission to access the camera and photo library of your device. The camera is used to take a photograph of the player for their user profile, which is used to track and retain progress through the game – you may also choose from a number of characters from Sarah & Duck to represent the player in the user profile. The photo library is accessed in order to store pictures the player may take of the parks they can create in the final activity of the app. When asked, you will be given an option of accepting or turning down permission. If you turn down permission to use the camera, you will not be able to take a photograph for the user profile. If you turn down permission to access the picture library, you will not be able to save a picture of the parks that are created in the parking building part of the game. A Scary Beasties production for BBC Worldwide. To Download Sarah & Duck – Day at the Park For PC,users need to install an Android Emulator like Xeplayer.With Xeplayer,you can Download Sarah & Duck – Day at the Park for PC version on your Windows 7,8,10 and Laptop. 4.Install Sarah & Duck – Day at the Park for PC.Now you can play Sarah & Duck – Day at the Park on PC.Have fun!